I have long been a fan of the Peter Wimsey books, by Dorothy L. Sayers. 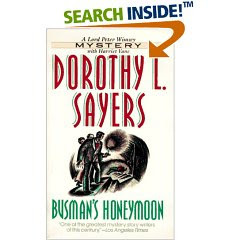 Busman's Honeymoon is the last in the series, written in 1937, and it starts with about half a dozen letters from characters we know from earlier books. They are all describing the wedding between Lord Wimsey and Harriet Vane. The book is about equal parts mystery and love story, switching back and forth between them, taking place primarily over the couple's honeymoon, in a house from her childhood where there is (surprise, surprise) a murder. The mystery is quite up to the usual Sayers standard, complete with so many plausible suspects that your head will be spinning like the main characters'. Throw in a poetry quoting country police superintendant and Bunter's transition to the country and serving a lady as well as his gentleman, and you have several additional side stories of interest. The love story, as it unfolds, however, is nothing like any other Wimsey story. It's also not like any other love story I've read. The thickening plot presents the newliweds with a series of complex situations, and the way they handle them speaks eloquently about British society in the 30's, Sayers' views on marriage, and a great deal about what love COULD be between two sensitive and intelligent people. A few passages left me pondering for hours. I won't say more than that - but you must read this in an unabridged version if you want the entire story. I believe an abridged version would remove much of the dialogue that makes the love story so enlightening, and you also wouldn't want to miss all the details and dialogue of Bunter, Superintendant Kirk, Mrs. Ruttle, Mr. Puffet, and, of course, the Dowager Duchess. A delightful read from end to end. Oohhhh I still have this sitting on my bookshelf. I received it as a gift ages ago and it got buried in the pile of other books to read. However, it might just need to resurface for entertainment sake! Thanks for your review. Oh, this is one of my favorite books ever. I re-read it every few years, and it never gets stale, and I get more out of it every time. Personally I found the love story beautiful and wasn't interested at all in the mystery. Not sure why.